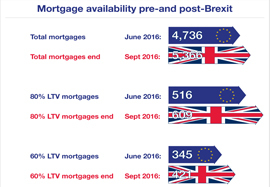 Fears that the mortgage market would be adversely affected by Brexit have so far proved to be unfounded, with new figures showing the number of available deals is up and interest rates are down since the referendum. A study by Which? reveals there is now greater choice in the market, with homeowners able to pick from 5,336 mortgages at the end of September compared with just 4,736 in June. In addition, the cost of borrowing has fallen since the vote on 23rd June, with the average mortgage now repaid at a rate of 2.85 per cent - down from 2.99 per cent three months ago. Kevin Shaw, national sales director at property specialist Leaders, says: “Despite fears that Brexit would make it more difficult and more expensive to get a mortgage to buy a property, the opposite has actually come true. “Not only are interest rates down, but availability is up for both first-time buyers and those planning to remortgage in order to take their next step up the ladder. The statistics show the number of 80 per cent mortgages available to first-time buyers rose from 516 to 609 between June and September, while rates fell by 0.1 per cent to 2.84 per cent. Meanwhile, existing homeowners looking for a 60 per cent loan-to-value mortgage enjoyed an increase in the number of deals available to them from 345 to 421 over the period in question, while the average interest rate for this type of mortgage fell to 2.23 per cent. Kevin adds: “While nobody can be sure of what the future holds, the initial post-Brexit indications are that house prices will not crash and people are still keen to sell. For advice on buying or selling a property contact your local Leaders branch. For impartial mortgage advice and access to the best rates on the market get in touch with award-winning mortgage broker MAB today.